GBS is a certified technology partner with Zebra Technologies and offers their complete line of thermal, counter-top and mobile printers. GBS is also a certified distributor of Motorola/Symbol handheld units for use with EasyID. The MC-70 is designed to withstand all-day every day use in nearly any environment. This rugged compact device delivers true anywhere, anytime wireless WAN/LAN/PAN voice and data communications, including superior voice functionality, data capture and the power to run nearly any application.We leverage the power of the MC-70 mobile computer as a component of our EasyID system for point-of-care patient ID confirmation and label printing.Contact us at 800.349.4531 to determine the best Motorola product to meet your needs. Zebra’s HC100 printer puts the legendary Zebra thermal reliability that uses easy-to-load cartridges containing the only antimicrobial-coated wristbands on the market. This all-in-one solution was specifically designed for the Healthcare market. Changing wristband sizes or colors is as easy as sliding a cartridge into the top of the printer. Need to print labels on the go? Zebra’s QL Plus Series of printers offers lightweight, rugged mobile print capabilities. In addition to offering user-friendly options and flexible connectivity, the enhanced QL Plus printers are specially designed for complex mobile printing applications. They are built to handle increased levels of wireless security making them ideal for the secure transfer of sensitive data such as printing patient information at point of care. 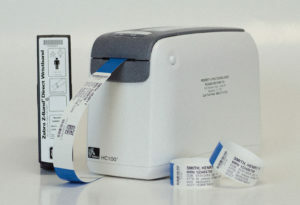 We leverage the power of the QL-220 Plus printer as a component of our EasyID system for point-of-care patient ID confirmation and label printing. Contact us at 800.349.4531 to determine the best Zebra thermal printer to meet your needs.